Every time I feel like I’ve grown past the need for validation from triple-starring a level in a puzzle game, I find myself drawn into a game like King’s latest, Pet Rescue Puzzle Saga. Say what you will about Candy Crush Saga creator King, the Activision-owned developer knows how to make puzzle games feel good. 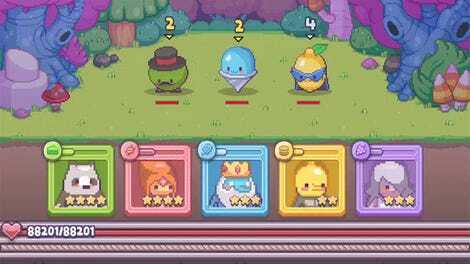 Every time a new Something Whatever Saga game comes out, my fingers start to twitch, anticipating the colorful explosions, catchy music and cutesy animations accompanying each completed game level. The very best part comes right at the end, as the score tallies and those three stars—earned for playing the level exceptionally well—thunk, chime or bounce into place. One, two, three, I am the greatest puzzle solver of all-time. Pet Rescue Puzzle Saga is a perfect example. 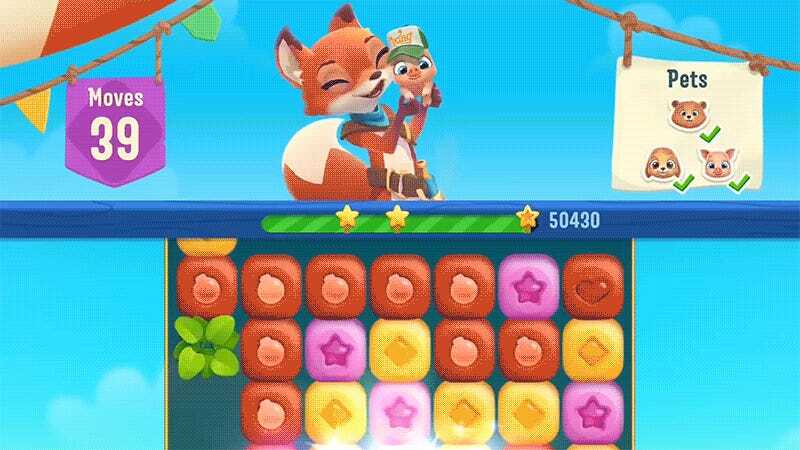 The second game in the Pet Rescue Saga series, available for free on iOS and Android, the game follows Fern the Fox as she travels from level to level, saving lost pets from peril. At least that’s what King wants us to believe. My interpretation of this tale of pet “rescue” is that Fern, like most foxes, is an opportunistic scavenger who preys on small animals and livestock. Aside from earning those glorious stars, my other impetus for playing Pet Rescue Puzzle Saga is an imagined ending where the home Fern builds for these “rescued” pets becomes a slaughterhouse as she and her litter of kits mercilessly devour puppies, froggies, monkeys and bunnies. My head canon primed, I charge through the first several screens’ worth of match-two puzzles. Tapping two or more adjacent blocks of the same color causes them to disappear, clearing plants, breaking ice and sweeping away clouds in the process. This opens paths for my prey to reach relative safety. Do it with enough moves left over, and I earn the coveted three-star rating. Do it with enough style, consolidating colors into large groups to produce power-ups and combining those power-ups with other power-ups to create larger power-ups, and I also earn the coveted three-star rating. Alas, that three-star feeling doesn’t last. All matching puzzle games work the same way. The first screen or two of puzzles are easy enough that just about anyone can get three stars. As the levels progress, the difficulty rises. The colored blocks aren’t forming groups as conveniently as they did at first. The ice is thicker. The clouds are darker. Fern is hungrier. Three stars become two. Then one. I call it the failure trail, and it is inevitable. Pet Rescue Puzzle Saga doesn’t take long to go from happy, celebrating bloodthirsty vixen to sad, defeated fox, begging for gold bars so she can make one more attempt at filling her pantry. It’s here that my journey with Fern ends. I came to the game for those three glorious stars. When they stop coming, I stop playing. There are too many match puzzle games out there for me to linger on failure. We had a good run, Pet Rescue But Secretly Being Eaten By Fox Puzzle Saga. I will seek my stars elsewhere.